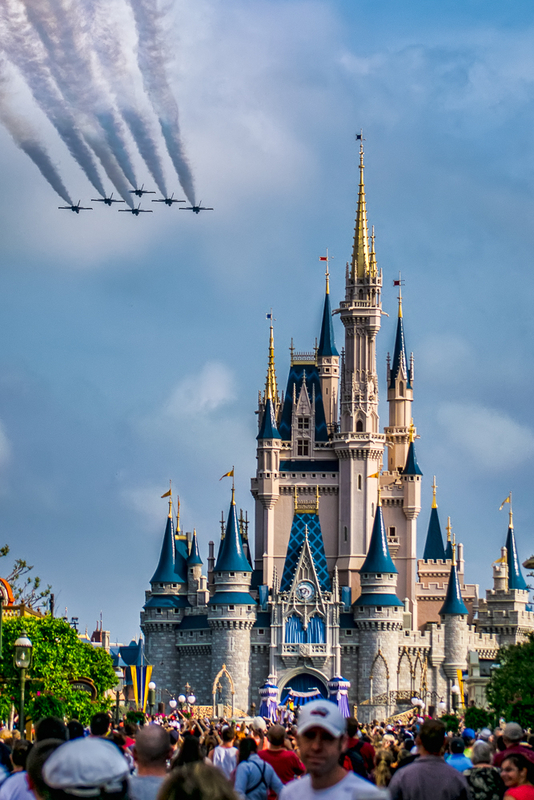 While visiting Walt Disney World last week, I was fortunate to be in the Magic Kingdom at the time that the Blue Angels flew over the iconic Sleeping Beauty’s Castle. This wasn’t something that I was expecting when I arrived in Orlando at the beginning of the week, but due to posting some photos on my personal facebook page, a friend of mine shared the news with me and I made arrangements with the family to be in the park the morning of the fly-over. The Blues made two fly-overs on this day. This was the first. They came into the park at approximately 9:40am and first flew over the park entrance, down Main Street, and over the Castle. On the second pass, they came back the opposite way, that time, again in their delta formation, but broke off right before heading over the Castle for the second time. This was quite an experience, as I’ve grown up as a fan of the Blue Angels, and a fan of Disney World. Capturing the two in the shot was quite memorable.